WWWW: More Web site compatibility testing on its way? More Web site compatibility testing on its way? Mozilla recently announced that it intends to enforce use of HTTPS for various Web site features in its browser Firefox. On reading this I groaned inwardly and thought more Web site compatibility testing, just what we were asking for. Before asking what or who is Mozilla and why should I care anyway? let's do a quick survey of Web browsers. There are lots of browsers, but among the top 10 you'll find Google's Chrome, Microsoft's Internet Explorer (IE), Apple's Safari, Google's Android browser (not the same as Chrome for Android and steadily declining in importance), Opera has a couple of browsers and there is Firefox. It's very hard to say how the browsers rank in popularity, since this varies over time, according to geography and what type of Web site is being accessed. 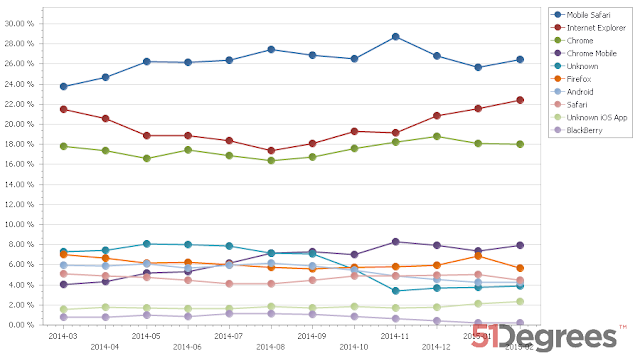 However, world wide, Chrome and IE are generally numbers 1 and 2 and Firefox is number 3 in popularity. In this sample you'll see that Mobile Safari comes out top (meaning iPhones and iPads) and Firefox comes out about fifth. If you're interested you can play with the 51 degrees data, and likewise you can do so at StatCounter. There are many other sources of similar data. I won't attempt to explain the difference between the stats, other than to note that you have to be careful to distinguish whether you are measuring visitors, visits or hits, and you have to be clear whether you think mobile Safari is the same as Safari, etc. etc. etc. (x1000) and indeed how accurate the analysis is at telling which browser is which. For the purposes of this discussion, (Mobile) Safari is important in the UK, as unsurprisingly are Chrome and IE. Which Browsers Visit Your Site? You can measure what proportion of which browsers visit your web site and it's important to do so. If you're targetting particular UK demographics then it's likely you're going to have a lot of Safari and Mobile Safari users. There are many tools that help you to do this, for example lots of people use Google Analytics. You're going to want to measure the proportion of users of particular browsers make it through to the various parts of your site you'd like them to reach. If there is a skew, perhaps between mobile and non mobile users, then you may have a usability problem or a mobile friendliness problem. I mentioned a couple of weeks ago that Google had announced its intention to change its ranking algorithm depending its perception of a site's mobile friendliness. You should have an eye to mobile friendliness - at a minimum because of SEO, but preferably because you case about your users' experiences. Originally, the Web wasn't designed for Web pages to look the same in different browsers. Indeed it was thought that you, the reader of a Web page, might want to control the appearance of Web pages created by other people. With that in mind it's possibly not a huge shock that Web pages don't appear the same in different browsers, even though the Web site owner would like them to. And this is nothing to do with Responsive Design, it's because different browsers behave differently. Responsive Design just makes that more complicated than ever. It's made more complicated by the fact that the Web is frequently adding new features and different browser vendors implement those features in different order to each other (sometimes don't implement them at all) and their users update their browser software haphazardly if at all. Mozilla's announcement looks set to make that more complicated still by proposing to switch off features in the browser unless those features are accessed using HTTPS. All in all, quite a headache. As ever hope all this is some use. HTTPS is the allegedly secure version of HTTP, which is the mechanism (protocol) by which browsers request content from Web servers and get it back. With (non-S) HTTP your request and the response can be read by any intervening equipment in the network. HTTPS prevents that happening directly, but is open to some criticisms of its overall effectiveness. Who or What is Mozilla? There is a well known saying which goes, if it's free, you are the product. We, as users of Microsoft's, Apple's or Google's browser, find that integration with their environment and services has lots to recommend it in terms of usability and convenience. We probably know that they are using our data and that our privacy is compromised at least to some degree. (Well if you didn't realise that then it's well past time to become aware). Mozilla is the foundation that creates the Firefox browser amongst other open source software. Our mission is to promote openness, innovation & opportunity on the Web. A key point about Firefox is that unlike other browsers it's not owned by a commercial organisation. This means that they are free to champion browser user interests, such as privacy, over commercial gain for their shareholders. If you're concerned about such things you've got to welcome that this organisation exists. You've got to welcome that Mozilla is working towards making the Web more private. One possible outcome of Mozilla's HTTPS initiative is that everyone (Web site owners) ignores it and users of Mozilla browsers will get fed up as more an more sites don't work for them in Firefox, whereas they do in other browsers. You'd think that Mozilla has considered that risk, but then again, it's not a commercial organisation, so maybe its success metrics don't include maintaining or increasing market share. In the meantime, as Web site owners, I suppose we need to grin and bear yet more and more complicated and costly testing regimes - just for the sake of getting our Web pages on the screens of our users in a form that is approximately like we had intended it to be.